Great Cottage, Ski-in/Out, Walk to Village, Lodge, Golf! This is the place where you want to be! You are right in the center of Tamarack Resort and you can walk to everything. The kids are on their own to come and go and do what they want while you do what you want. A true vacation! In the winter you can ski right out the back door onto the lift and then stop back for lunch in your own cottage and still go out for another session. With seven lifts and 2800 vertical feet and an average snowfall of over 300 inches, Tamarack has 42 ski runs to challenge even the best of the best. For the free rider, Tamarack’s 22' Olympic-sized Super pipe and two terrain parks offer unlimited adrenaline rushes. Snowmobiling is incredible here. Explore Idaho's back country on the groomed trails of the spectacular Payette River Mountains. In the summer you can ride the cottage bike trail to the Challenge Park or to the Jump Park or ride the exhilarating 30 miles of IMBA–designed trails that twist, turn, roll, and drop through Tamarack's forested mountain and meadow trails. Ride the lift for 12 miles of twisting downhill single-track with exhilarating rock drops and jumps. The meadow trails have more than 18 miles of awesome single- and double-track near creeks and rolling meadows. You can walk to the village with all the restaurants and shops or to the lodge, spa and golf course for a quick round of golf at Osprey Meadows Golf Course. This course was awarded the Best New Public Course in 2006 in the USA! It is awesome. For the golf enthusiast there are five championship golf courses within a short drive. Jug Mountain Golf Course (20 mins. away) just received the award for 2nd Best New Public Course in 2008. On the adventurous side, don't forget to make a reservation for a zip line tour. Explore Tamarack Mountain in a unique, thrilling, action packed, Zip line tour. Experience the rush and listen to the cable sing as you 'zip' over 4,425 feet of incredible terrain. You'll descend down 8 different zip lines, soaring over creeks, canyons, and forest as you come to rest on a platform high above the ground in a majestic ponderosa pine. Also, Idaho is the whitewater capital of the USA. There are numerous companies that will guide you on local rivers. This is a breathtaking experience not to be missed! From Class I float trips to running the wild rapids of a Class IV river, there is something for everyone. The scenery is absolutely gorgeous and the experience is priceless. Tamarack Resort operates a full service marina on Lake Cascade where they offer a large selection of boat rentals: water-ski and wakeboard boat, pontoon boats, fishing boats, kayaks, Hobie Cats, and sailboats. Don't forget Happy Hour on Tuesday nights on the waterfront. I hope I have peeked your interest. There is so much to do at Tamarack, it is an outdoorsman's dream. This is why we chose to own a place here. Now it is your chance to experience all of this! Give us a call or email us now. I promise you, you will be glad you did. More than likely you'll fall in love with the place and come back again and again! HELLO and WELCOME from the Lamming Family! Thank you for viewing our website and if you choose to stay in our home in Tamarack we are sure you won't be disappointed. We lead a very active lifestyle and enjoy the outdoors very much. Tamarack and the surrounding area offers so much to do no matter what season it is! We really enjoy snowboarding and skiing which was our initial attraction for a ski in/ ski out slopeside home. We have since discovered snowmobiling as a great family sport. During the summer we have enjoyed the golfing, zip lining, fishig, white water rafting, hiking and photography. The natural beauty of this area is unsurpassed! Our home is centrally located in Tamarack Resort so once you arrive you can walk to everything, I'm not kidding...really! We love lounging in our own private hot tub on the back deck listening to Rock Creek gurgle down the mountain. It is a great place to unwind and just plain RELAX! Tamarack Village is 90% complete. It will be an awesome pedestrian-only European flair experience. Awesome views of Lake Cascade from the mountain! Gorgeous views! Fall colors are awesome. Right on the run with a lift serving our cottage! Full size refrigerator complete with ice maker. Everything you need right down to the blender and a corkscrew. Many videos in the guest room for your use. Adjoining covered wood deck with spa overlooking Ski run and bike trail. Enjoy the pool at the lodge anytime. Your own private hot tub on the back patio. Enjoy the warm water and jets while staring at the stars and listening to rushing waters of Rock Creek. We could easily walk to anything within Tamarack Resort. The cabin was well appointed and the spa was a bonus! We will be back to cottage 18. Our family thoroughly enjoyed the time in 18! Convenient ski in/ski out cottage. Clean and well maintained. Even had fresh snow. Hope we can return soon. We are so glad your vacation was awesome! Tamarack is such a special place and fresh snow always makes it better! Loved the many amenities that are offered with this property. 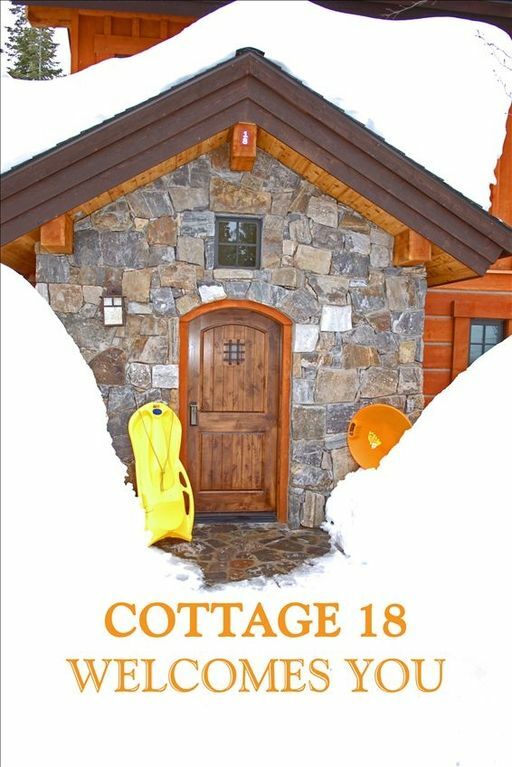 Cottage #18 is great! The owner & property mgmt are great to work with. Wonderful cabin with great access to mtn biking! Overall, we very much enjoyed our 3 night stay at this cozy cabin. The cabin was clean and comfortable. Master bedroom and bath are very nice and the master bedroom steps out on to the deck (with hot tub). The cottage is located close to the Tamarack pool and fitness center and is just across from lower Pinnacle mountain bike trail! Cabin was not very well stocked. Basic cooking supplies are needed (salt, spices, cooking oil) and the kitchen is small for a family who likes to do their own cooking. Pots and pans were a bit worn and are nearing the end of their functional life. We could also not get the ice machine to work. A few light bulbs in the cabin were not functioning and need to be replaced. Thanks for your review. We routinely remove ALL food items between guests since many of them have already been opened (and could spoil). We checked on the light bulbs and the ceiling fans had been inadvertently switched by prior guest to only operate on 2 bulbs instead of all 4 (energy-saving feature) so we have reset them. The ice machine is also switched off after each guest and the ice is dumped out for cleaning the freezer/fridge. We always strive for EXCELLENCE (5 stars) so if there is ever an issue we are only a phone call away (speed dial "Front Desk") or stop by where you checked in and we will be glad to help you! Had a great time. Cottage was well stocked and clean. Hot tub was a bonus. Great ski in ski out location. Will be going back in the summer time! As always we are glad you had a great time! Our goal is excellence (5 stars). Please let us know if there is anything we can do to improve your stay with us. Cottage 18 is in a beautiful location. It was very clean, which is always top on my list of importance. We are the "Center" of Tamarack Resort. You can easily walk to everything. Thanks for the great review! We are glad you had a great time! See ya next time. wakeboarding, incredible zip-lining tours, fabulous Frisbee golf course, awesome photography opportunities!